We are still reeling from the news about the 31 dogs who died in the blaze at Bully Life Animal Services near West Chicago and are so proud of how our community has come together to help. In honor of the lives lost, we want to help in the best way we can. We would love to share your story about the fur baby in your life. How have they healed you? How have they affected your other relationships? What makes your connection unique? Share your story with us! Your story can inspire someone to adopt their own fur baby and, by adopting one animal, you’re making room for others. Contact us today to schedule your personal photoshoot with your fur family… Both your $50 session fee and 5% of your purchase will be donated to homeless animals. 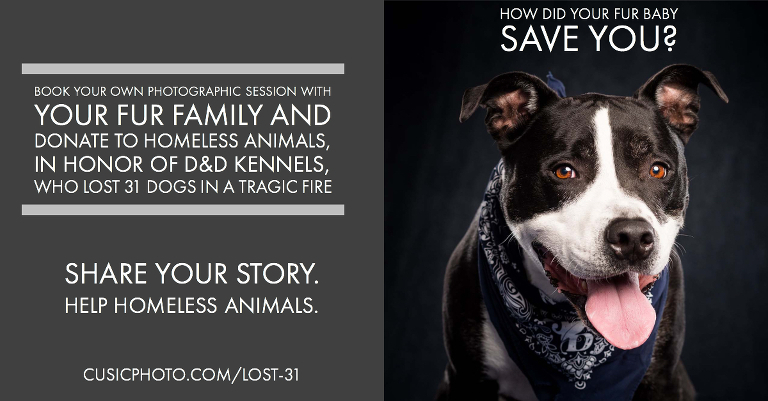 You really can give back to animals in need just by sharing your love story. When is the best time for Candice to call you? Tell us in 25 words or less who you wish to share your photographic experience with! « Chicago Wedding Photographer: Thank you 2018!